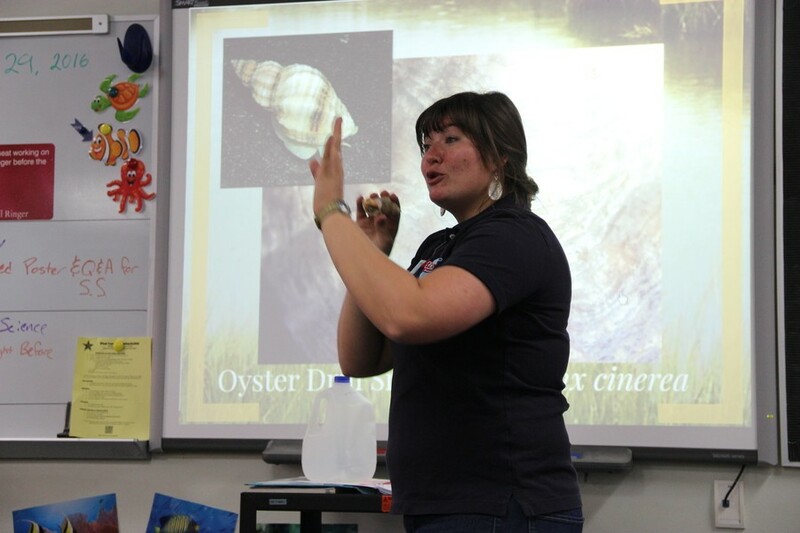 Rena Elser, the program coordinator of Texas A&M Sea Camp, gives a presentation about sea animals on Monday in Laronna Doggett’s aquatic science classroom. During her presentation, Elser passed around massive sea shells and pearls from oysters. After Rena Elser opened a PowerPoint full of aquatic creatures on Monday, and stood in front of Laronna Doggett’s science class ready to dive into the wonders of the aquatic life, the room got silent and all students turned their eyes toward the program coordinator of Texas A&M-Galveston Sea Camp. The presentation began indulging into the different species of oyster, crab, sponge and shrimp her aquatics class is studying while Elser presented facts such as “crabs can’t chew” and passed around pearls from oysters. This captured the class as their excitement bubbled, and they asked questions about the different aquatic animals. And Doggett’s aquatic science students were just as excited as they slipped behind the lab tables, after the quick presentation about the different aquatic life, and examined the small crabs in the platter and cut open the oysters. Coppell High School senior Will Harrington talks about his passion as he and his lab partner, CHS junior Crystal Chaves, examine the mouth of the oyster. Harrington grew up in California so moving to a place near the ocean caused him to be really interested in the ocean and marine life. Coppell High School seniors Alyssa Cervantes and Chene Noel pick up oysters and crab on Monday in Laronna Doggett’s aquatic science classroom. Cervantes and Noel learned to distinguish the different types of crabs after Rena Elser’s presentation. relationships that happens within these environments,” Harrington said. But Doggett’s aquatics science class isn’t the only class to explore these marine species. 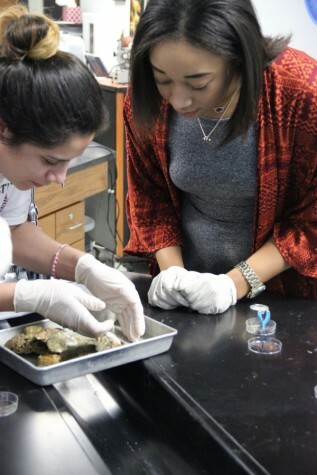 As Doggett’s biology class also explored the anatomy and importance behind the oysters that the other biology classes never got. With the outreach program at Texas A&M-Galveston reaching out to CHS, students were able to explore their passion and understand not only the job of a biologist, but also the ecosystem and learn about creatures never heard of.